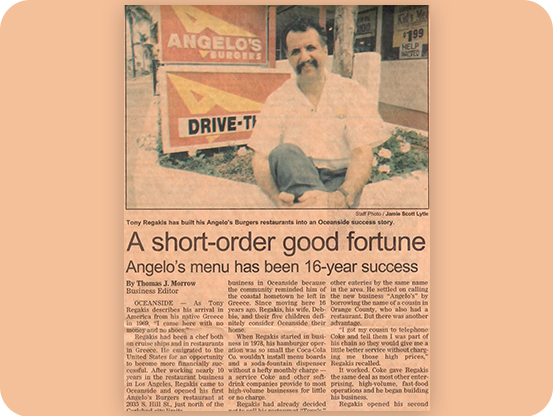 Angelo’s Burgers first opened in 1978, and now has 4 locations in Oceanside and Encinitas. Tony Regakis started it, and now he and his whole family run the restaurants. Angelo’s Burgers is a true family run business. Tony opened the first location in 1978 and now there are four locations along Coast Highway. Tony runs Oceanside North and Encinitas, while his son Louie runs Oceanside South, and his daughter Athena runs Oceanside Central. You can find them there most days, working to create the delicious burgers and meals locals and visitors love so much. At Angelo’s Burgers, we make everything fresh. We use the best ingredients and make your food to order. For our burgers, we grill beef patties, add onions, sliced tomatoes, pickles, put it on a seeded bun, and add our special dressing. Add some homemade zucchini fries or onion rings, plus a soda or shake, and you’ve got a great combo meal! It’s not just burgers at Angelo’s. We have some favorite Mexican dishes like hueveros rancheros, tacos, and burritos. Or try our Greek gyro sandwich, which Tony prides himself on bringing a little bit of Greece to you to try. If you want something on the lighter side, try one of our many salads made fresh that will crunch when you dig in. What will you order? 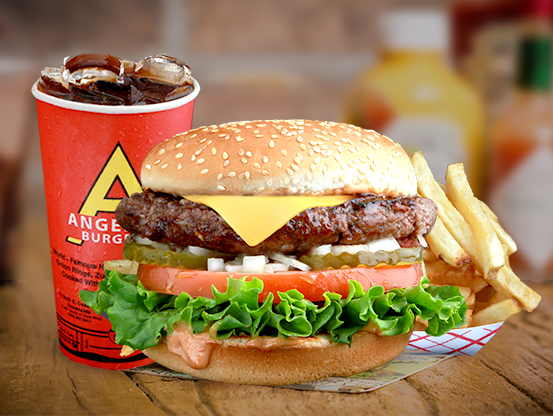 Angelo’s Burgers is real Made in America story. Tony emigrated from Greece and spent 10 years in Los Angeles working in the restaurant business. He loved Oceanside for its coastal community that reminded him of his old home. He chose Oceanside for his new home and opened up the first Angelo’s in 1978. Fast forward to today, and there are four restaurants in Oceanside and Encinitas. Tony is celebrating 40 years of proudly serving great food.